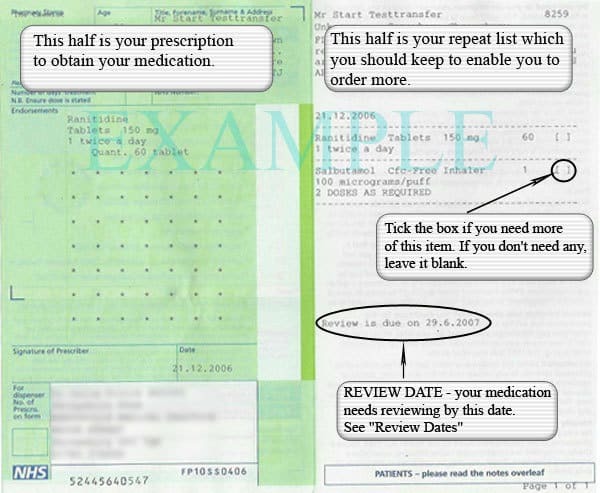 Patients on long-term medication can order repeat prescription using the tear off slip attached to their last prescription. Simply tick the items required and forward it to the surgery. PLEASE NOTE ONLY REPEAT MEDICATION CAN BE ORDERED ON LINE. PLEASE DO NOT USE THE COMMENTS BOX TO ORDER MEDICATION. ANY ITEMS NOT ON REPEAT PRESCRIPTION WILL ALWAYS NEED TO BE REQUESTED AT OUR RECEPTION. The following pharmacies have a free delivery service available on request for house bound patient only. We are a fully computerised surgery and, for your safety all routine prescriptions are produced on our computer. If you need a repeat medication of something that you regularly receive, then you do not need to see the doctor. There are three ways in which you can request repeat medication. A list of your repeat medication can be found on the green tear-off slip which accompanied your last prescription. Simply use this green slip and tick what you require. Then give it to us and allow us 2 days to process your request. Either post, hand-deliver or fax the green repeat medication slip to us – if you are unable to do this, then please get a relative, carer or friendly neighbour to do this for you. There is a prescription box inside the building for use during work hours. Outside of work hours, use our letter box which can be found on the left hand side (side wall) of the main entrance. After 2 days, you (or a relative, friend or carer) can come to the reception desk and simply pick up your prescription. Alternatively, you can ask for it to be sent to a particular chemist and then collect it from there. Please enclose a self-addressed envelope if you wish us to post the repeat prescription back to you rather than you collecting it. Alternatively, you can email us with what it is that you want. If you decide on this latter method, please spell the medication carefully and any dosages that go with it. Double check what you have typed. You can use the internet to log in and request prescriptions You just need to register for this service first by contacting the receptionist, please bring some photo ID with you when registering for this service.